There are 13.1% more occupied households in California today than in 2000 (as of 2017, the most recently reported Census year). However, that increase has not been a steady upward march of owners and renters alike. 18.6% more households rent in California today than in 2000. In contrast, homeowners have grown in number by only 8.9%. 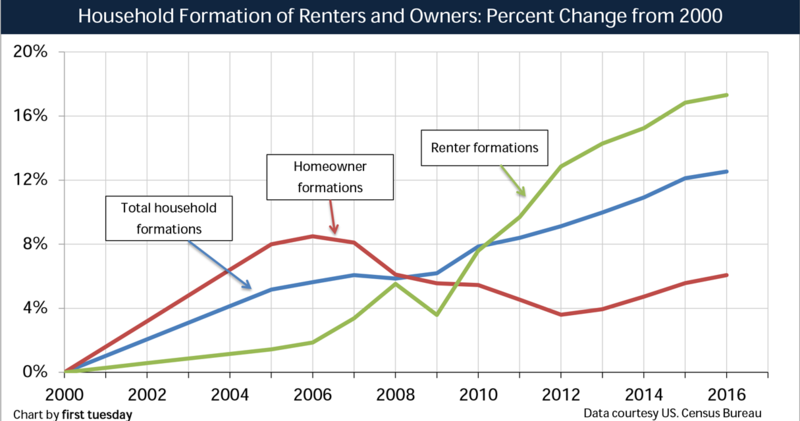 Prior to the 2008 recession, owner household formations outpaced new renter households significantly. During and after the recession, that pattern reversed. This remains true today as most potential new homeowners are held at bay by broader economic factors. Those factors are primarily slow wage growth, over-inflated home prices, and family foreclosure experiences which delay entry into homeownership. Updated April 9, 2019. Original copy posted January 2015. While household formations continue to rise at a steady clip, a significant trend in the types of these formations has taken shape since 2008. About 19% more households rent today than in 2000, whereas only 9% more households are owner-occupied. During the Millennium Boom, homeowner formations increased more quickly than renters, due to the allure of easy financing and rising home values. However, the trend reversed by 2010. 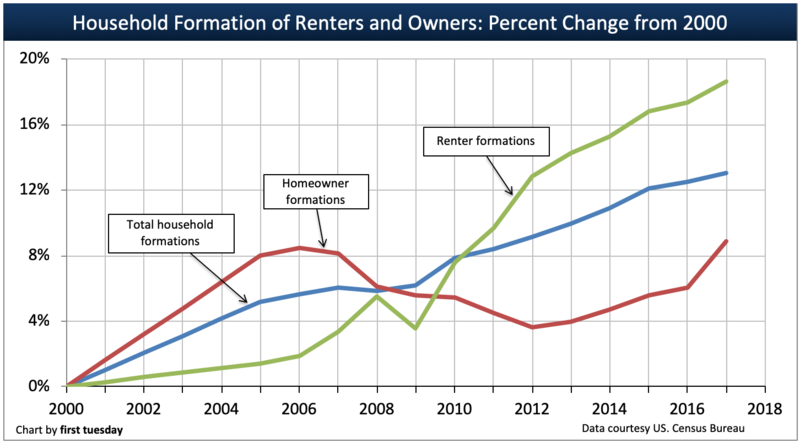 Growth in renter households continues to eclipse growth of homeowner households today. Roughly two-thirds of the rise in renter households can be attributed to more single family residential (SFR) renters, according to a report by Zillow. The other one-third of the rise is due to tenants moving into multi-family units. Sensibly, the trend would be reversed in a normal housing market, with a greater share of new renters moving into multi-family units and a smaller share moving into SFR rentals. However, the recent trend is a reflection of the mass of foreclosures in 2007-2013. 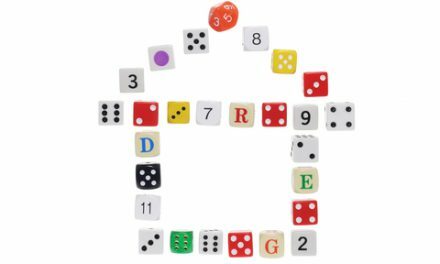 Many SFRs lost to foreclosure were converted into rentals, directly or indirectly, for those same foreclosed-upon families. On the other hand, recent college graduates or those moving out of the nest for the first time make up a significant portion of new renter households moving into multi-family units. This generation — Generation Y (GenY) — will spend more of their lives as tenants than did their parents’ generation. Most Gen Y households are expected to put off homeownership until later in life, if not indefinitely. Currently, the homeownership rate for individuals aged 25-34 in California is 35%, down from 41% at the height of the Millennium Boom. That’s because young adults were hit by the 2008 recession just as they were gaining a foothold in their careers. Now, it’s going on eight years, and we are finally seeing some resurgence in the employment market. However, Gen Y income has been stunted irreparably and their attitudes about ownership damaged by the Great Recession. This means first-time homebuyers will save for down payments over a long time period. This process has not even begun for a significant portion of this demographic, as residential rents have increased much faster than incomes, making saving difficult. In some parts of the state, it’s common for renters to pour half of their income into rent. But if you look far enough, there is a bright spot on the horizon. Once Gen Y makes a solid showing in the improving jobs market and their savings accumulate sufficiently, Gen Y’s massive population bulge will give California’s low-tier to mid-tier housing market a boost. This wave of first-time homebuyers are expected to enter the housing market in the years following the next recession. At the same time, Baby Boomers will be retiring and looking for replacement homes. 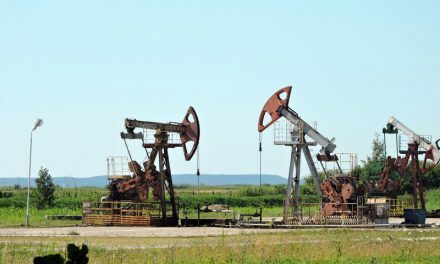 All of this activity will result in The Great Confluence of homebuyers, increasing both home sales volume and prices as we head into the next decade. In the meantime, use marketing materials that speak directly to renters in your area. Too often tenants simply assume they’re unable to qualify to borrow and buy. 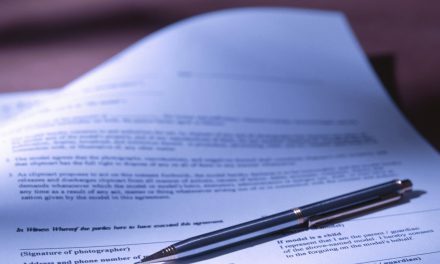 And even if they aren’t ready to buy for a few years, establishing a relationship now as an agent they can trust for solid advice is a good first step in becoming their buyer’s agent when they are ready.